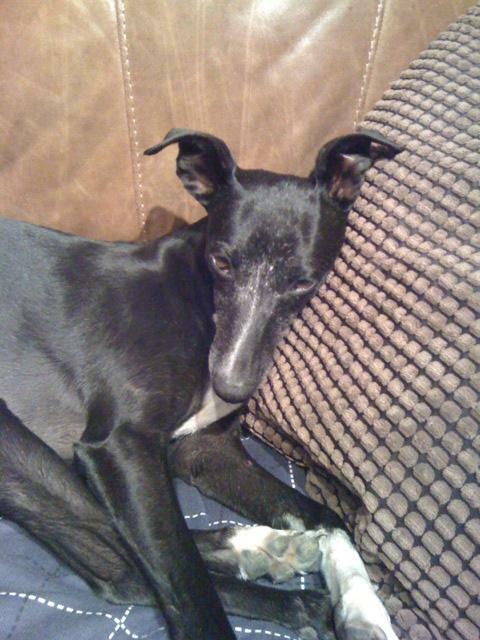 Jess is our 6 year old ex-breeding whippet, saved from possibly being put to sleep after being handed in to a dog warden. She was given up when her usefulness to her owner had passed. She had only ever lived outside, never knowing the comforts of home or the companionship of other dogs. When she came to us, she was very insecure, unsure of the world around her, scared of noises and dogs she didn't know... she had never even been allowed on grass before. After a few months of gently introducing her to life, and learning from our other dogs, she soon realised she didn't have to be scared. Now she is a cheeky little girl who demands... and gets!... lots of love. She adores being part of our 'pack' and revels in all the attention she gets from people when we're out and about fundraising!